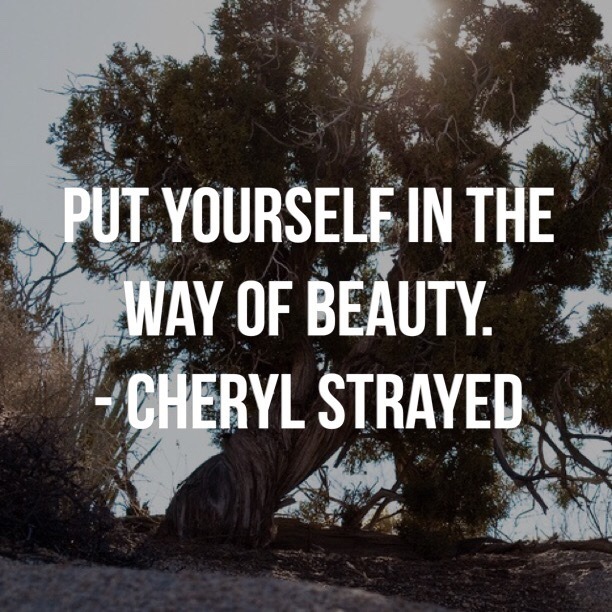 I’m taking Cheryl Strayed’s advice for 2016–putting myself in the way of beauty. I plan to laugh more, to dance more, to hug more, to give myself more breaks. And I’m officially burning that old shame file (the one where I keep tabs on all my mistakes). 1. If I want to change something in my life, my thoughts and consciousness are a far better tool than physical effort. 2. Life (or the Divine Buzz that animates everything) is always on my team, re-creating my thoughts and consciousness out here in physical form, making it easier for me to see. 3. I’m here on the physical plane to play around with this animating energy, to have fun, to experience joy. Tell me in the comments sections below what beauty you plan to stand in front of this year. I’m flinging myself onto the tracks of romantic love, excessive money, and joyous travel. Love that–flinging myself onto the tracks! Glad we don’t have to rely on Doodley Dooright anymore to untie us. We are free to fling ourselves into whatever great adventure we choose. Abundance of all kinds! Doing less and being more..saying yes before I say no..and meeting the parts of myself I haven’t discovered yet. Blessings to you in 2016!! A magical year ahead. Abundance of all kinds! Doing less and being more..saying yes before I say no..and meeting the parts of myself I’ve yet to discover 😊😊 blessings to you in 2016!! A magical year ahead. Yes indeed. Here’s to saying “Hell yes!” And saying no when it takes away from the hell yes! This came at the perfect moment. Your book E2 has given me so much thrilling experiments and the outcome has been nothing short of UNIVERSAL!!! hehe!! GOD is GREAT and so is PAM GROUT!!! If you wasn’t for you I would never have learned so much about the LOA and AFFIRMATIONS. Thank you for being the great you that you are PAM!! HAPPIEST OF NEW YEARS!!! Thank you, Michele! Magic is the perfect word for 2016. I’m going to stand in front of success, welcome it in and embrace it. It is so. Let’s all embrace success, knowing that it’s waiting here with open arms. I shall launch myself into knowing ‘WHO I AM’ as many moments as I remember, throughout the day, and stand fast in that fact as I soar into a new year in joy and happiness and laughter! Happy New Year and Love to all !! To live continually in thoughts of ill will, cynicism, suspicion and envy is to be confined in a self made prison hole. So from this day forward I promise ” To think well of all, to be cheerful of with all, to patiently learn to find the good in all — such unselfish thoughts are the very portals of heaven — and to dwell day by day in thoughts of peace toward every creature will bring abounding peace to the possessor. Love James Allen. Thanks for the great reminder! I plan to stop moaning about taking the dog out in the rain because I’m lucky that I’m healthy enough to do it. Rain doesn’t hurt you, so I’ll dance and splash in the puddles and love doing it in 2016! What great insight! We are all SO LUCKY! I mean, just that we get to be here, have consciousness and contribute to the big cosmic thing. And rain is fun…when we embrace it. Channel Gene Kelley. Thanks, Trish! Here’s to a year of seeing what we want to be. Knowing that what we see is what we’ll get. Our imaginations can build a new world. Wahoo, Trish! I’ll see you in Machu Picchu. I now see you walking, walking, walking and even dancing. Nothing wrong with being amazed. I still am….every day. And so glad you’re going to also act. With the dude at your side, how can you go wrong? Start my day with the Navajo prayer: In Beauty I Walk, with beauty before me I walk; with beauty behind me I walk; with beauty below me I walk; with beauty above me I walk; with beauty all around me I walk. I walk in beauty! It is begun in beauty, it is begun in beauty, it is begun in beauty, it is begun in beauty! (each said in a cardinal direction). Beautiful! I love this!! Can I borrow? Ooo! I love all 3 of yours Pam! And I’m def voting for even MORE play, abundance, joy and going easy on myself this year! Thanks for once again sending the perfect blog at the perfect time! My pleasure!! Thanks for the shout-out! Oh I’m so delighted to be part of this tribe! Thank you so much, Pam! I’ve read both E2 and E3. I too will (try) to burn my shame file. My joy next year? Totally unexpected….both of my daughters are pregnant and I will be a grandmother twice in 2016!!! You have so blessed my life and expanded my understanding. I’m burning my shame file, too. I’m off to be authentic me… created from magnificence, brilliance, joy, abundance, and bliss. C’est moi… happy introvert, happy explorer, happy adventurer! I plan on….wait, scratch that! I am going to ride my horse more and be out in nature every chance I get! I am putting myself in front of the beauty of mother nature! I am also open to the possibilities of love and success that the Universe has in store for me! Pam Grout, you are such an inspiration and I am eternally grateful for the words and wisdom you continue to share. I will stand behind(and in front of) the beauty of using my voice in the new year to share the magic of the universe that you reminded me is always there when awareness and openness allow it to unfold. I want to be an inspiration to others as you have been to so many people and to me. Thank You and Happy New Year! Catapulting myself into joy and love in each moment and releasing from self judgment and relax into the knowingness that Universe is on our side. This year my word is YES! Yes to adventure, yes to travel, yes to things that scare me. I am opening myself up to experience all the joy and beauty life has to offer. I want to See flowers Bloom and enjoy colors. Well, this year 2016 will be the best year I’d have lived not before. I’ll give a welcome to all beautiful things to come. I’ll be in a positive attitude ever waiting and doing the best of myself. The Divine Buzz is always on my team! This is my year to forgive myself and everyone else because we are all doing the best we can, we are all just trying to be happy and there is nothing to forgive really. This is my year to appreciate everything I do have and not worry about what I want but don’t yet have. This is my year to allow myself to let go of the past and future and allow myself to embrace and appreciate the moment, every moment. Finally, this is my year to allow myself to receive the bounty the universe has to give me. Pam, I truly appreciate the inspiration that I have received from your writing. Much love to you. XOXO! Help me to take things more seriously, especially laughter, parties and dancing. This is PERFECT- for others, not me of course !! I have found myself asking for a job where I could make more money (found and am in the process of applying). I wanted to be able to be more available to my own family. This will happen when I get the new job. I have overcome fears and anxieties. I have learned to not only trust myself, but trust in the universe. I am choosing to begin every day with a gratitude coffee mug where, before I pour my first cup, I write with a sharpie my gratitude list for the day. I wash it clean and use it again the next day. I will work to breathe more consciously and therefore become more relaxed and in tune with those around me. I am love and I am loved. I’m about to have cataract surgery and am looking forward to seeing things MUCH more clearly than I have for 61 years!